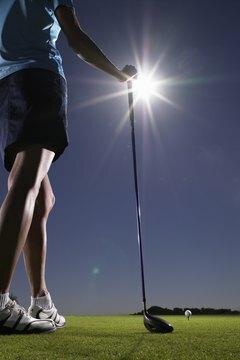 Golf club shafts have different lengths, weights, flexes and diameters. The shaft is considered the heart of the golf club, and there are key questions golfers need to answer when selecting a shaft: What is it made from--graphite or steel? How flexible is it? How thick is it? How heavy is it? And how long is it? The combination you choose depends on your game. True Temper is the No. 1 steel shaft company on the PGA Tour, according to TheGolfWorks.com. True Temper also makes a variety of shafts suitable for recreational golfers. True Temper's Dynamic Golf steel shaft has been the most popular shaft on the PGA Tour, and according to the True Temper website, 90 percent of golfers in any particular tournament play True Temper shafts. The Dynamic Golf shaft comes in different weights, diameters and lengths. It's also a shaft designed for the low-handicap player (10 or below). True Temper offers this shaft with a high-launch option and its patented "Sensicore" filling, which reduces vibration and stress on the hands and wrists. Through mid-August 2010, True Temper's Dynamic Gold shafts had been used by the winners of 14 PGA Tour events for the year. According to the Fujikura website, the company has been the top supplier of shafts for woods for PGA Tour players since 2003 and is a top maker of graphite shafts. The Motore line is Fujikura's flagship shaft for woods, and players using this shaft won the 2010 HP Byron Nelson Championship, The Players Championship and the AT&T National Pro-Am. Motore series shafts maximize feel throughout the swing. The shafts are available in different lengths, weights, diameters, flexes and launch levels. The leading supplier of shafts in Japan, Mitsubishi Rayon also produces graphite shafts for the U.S. market. The shafts are sold under the banner of MRC Golf, and according to a company press release in July 2010, 20 percent of PGA Tour players carried at least one wood with an MRC shaft. The flagship shaft is the Diamana series, the latest of which incorporates what the company calls its "multidimensional interlay" technology, which affects the stiffness and stability of the shaft and ideally results in better control. The Diamana series is available in different combinations of length, weight, diameter, flex and torque.